Update clothes it is impossible without taking into account fashion trends. Initially, therefore, the conversation about fashion. Its influence feel everywhere in the architecture of new buildings, in the objects of our everyday life, in the clothes of the astronaut, etc. Fashion is that at a certain time most popular and recognized by most. The clothes become fashionable when it is accepted by millions of people. It is human nature to desire for renewal, to change. And also, how to change the world around us, and changing the shape of the garment. Fashion always keeps up with the times. And this is natural.In our time, the rapid development of industry gives us new fabrics and materials, and the accelerated pace of life requires comfortable clothing. The main feature of fashion is its novelty. With the advent of each new fashion old clothes loses its aesthetics. The period of existence of fashion can not be limited, it can be equal to season, year, five or more years. The same costume over time changes. But sometimes long out of fashion suit begins to wonder, as if he stands the test of time. One of the designers speaking about the evolution of fashion, gave the following assessment of the same suit: for 10 years, until it is shameless; over 5 years - indecent; for the year before the advent of fashion - bold; fashion beautiful, charming, lovely; a year after the fashion of careless, 10 years after an ugly fashion; 20 years - funny; 30 years of fun; after 50 years - curious; after 70 years, attractive; 100 years - romantic; 150 years after fashion beautiful. Interest in "remote" mode led to the advent of retro style. Fashion took inspiration from the 20's and 30's, and 50's. Attracts us with its femininity model of the end of H1H-beginning of the twentieth century. Clothing of the ancient Greeks served as a model for the performance of various fabrics in evening dresses. A treasure trove of interesting designs and finishes is the people's clothes. It draws its ideas of modern fashion designers. You can't take fashion all indiscriminately, but it is impossible to avoid her. In each new trend, it is necessary to look for something that is close and suitable only to you, ruthlessly discarding all else, even very attractive to look at. Fashion does not dictate, it only offers and tells how to emphasize their individuality. Clothes of a different nature. It can be modest or extravagant, discreet or bold, sporty or lyrical. Type of clothing depends on her style. Style is all the variety of forms of clothes can be reduced to three main groups: clothes of classical style, clothing style and clothing style, fancy or feminine. Each style has its own form, details, finish, and comes in a variety of ways. Business woman will prefer a classic style, which is accentuated by the strictness and smartness. Originating in the last century, it remains in fashion permanently. Fashion does not make here the drastic changes, it only slightly corrects the shape: slightly wider or narrower shoulder, tighter or looser waist line, wider or narrower simply lapel. The clothing conforms to the natural forms of the human figure, simple, elegant. 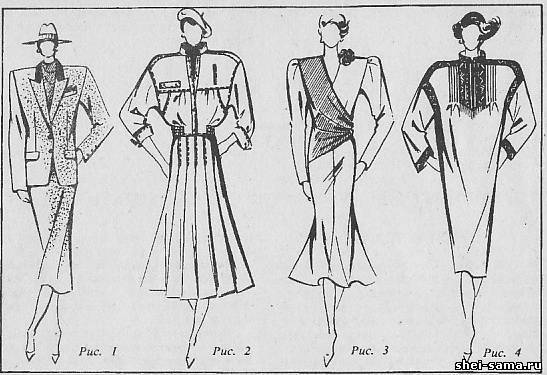 There's little carved lines, only those that create the form: relief for the decoration of breast, vtachnoy sleeve, waistline (stress cut in a natural place).The details in these clothes very small and only the necessary: or turn-down English collar, Welt pockets with leaflets, a valve with a processing "frame". Patch pockets are simple in shape and finish is almost absent. As the variety of this style offers the so-called men's style, which involves women's clothes men's cut: a clear shoulder line, waist line natural place, collars, pockets, slots - all in a men's jacket or coat (Fig. 1). Modern fashion made clothes in classic style using a variety of fabrics, finishing materials of different textures, the use of new forms of sleeves. Assortment of clothes of this style traditional: coat, short coat, a strict form of suits, dresses, jackets, and vests. Additions highlight the personality of clothes: hats, menswear, classic berets, scarves on the neck, a decorative handkerchief in his upper piece of the costume. Clothes of sports style (rice, 2) at all times was free-form, providing ease of movement. It should emphasize the sportiness of a human figure, slimness and smartness. The range is a coat sporting character, cloaks, a variety of jackets, shirts, blouses, skirts with slits and folds, tunics, waistcoats, trousers of different lengths and clearance jumpsuits and overalls. Various fit sleeves: set-in, Raglan, palurien, cap, sleeve, shirt style. Sport style is an abundance of detail. The form and nature of details are inspired by motives working clothes, clothes for pilots and astronauts, clothing for active sports. The collars are different stands, straight and Podkayne, quilted or stracenia on the strip of soft tissue. Popular collars-stand, reaching to the chin. They fasten with buttons, buttons, tabs. They can take refuge in bad weather or carelessly to throw away when warm. Can be used turn-down collars and the collars on the bar. Their form of squared or rounded. An important admission design in clothes of sports style are the pockets. A variety of sizes, shapes, decorative interior design. Pockets are available square, rectangular, triangular, oval edge, located asymmetrically on the product, double with two entrances. Pockets sports style executed different valve configurations, inverted pleats can be buttoned buttons, zippers. Available and new forms pockets of volume forms: the pockets forms accordion, envelope, portfolio, bags. Interesting pockets unfastened edge. Important value in clothing in sports has a clasp. It provides comfort and at the same time beautifies the product. Along with buttons buttons, zippers, clasp with hinged loops of leather, leather and wooden buttons in the form of sticks. A type of sports style can be considered to be the Safari style. So for many years called style, inspired by the ideas of African clothing for hunters. Once it was a new trend in sports, a shocking freedom and uniqueness. Bold to such an extent that made even neutogena fabric wrapped sleeves and unbuttoned a few buttons. Clothing in this style were limited to usual sports style shirt, a blouson and a skirt or pants with lots of pockets.The color was supposed to be protective, merging with the backdrop of the desert or Savannah, hence colors like sand and beige, with dyed blonde brown and green. The Safari was first performed in collection of French fashion designers. In its range and what the style sports: dress, shirt, and trousers - loose and wide. Definitely sleeves with low armhole different designs. Details of the sports. A sporty style for the young - style denim. It's jeans and a variety of products from denim: skirts, sundresses, dresses. Clothing style developed under the influence of the working clothes of free forms with a large number of patch pockets and other practical details. Additions to clothing - shirts, sports jerseys, waistcoats, pullovers, vests, scarves, mufflers, hats sewn of thick cotton, mixed mantle fabrics, leather and suede. Charm accentuate the feminine style. Clothing of this style is a sophisticated cover, unusual shapes, elegance of finish. Its design uses a variety of carved lines, symmetric and asymmetric, undercuts, drape (Fig. 3). Details on originality and courage that gives space to creativity and imagination. Collars you can choose very different collars-Cape, collars hoods, draped. The collars additionally usual forms and decorated with embroidery and trim. Flounces, ruffles, frill, kokila is also the details of feminine style. Unusual may be the closure on shoulder, side seam, on the back, positioned diagonally. A kind of feminine style can be considered a romantic style. This style and design characteristic of women's clothing of the 19th century: ruffles and flounces, bows, various lace details. Fit this style of light and transparent, satin and velvety fabric. Clothing, feminine style, complete the elegant hat with fields and without fields, with decorative flowers, feathers, drapery, and veil. Great value in the jewelry. The style, inspired by folk art, and folklore (Fig. 4), one of those links which bind the past of our nation, present and future. From century to century his silhouettes and paint are our dearest and nearest. The national costume has an unusual strength durability. In any situation, it emphasizes in a person such valuable qualities as dignity, elegance, refinement. The legacy of the folk costume is the variety of options available straight cut. The simplicity, the manufacture of clothing without special adjustment lies the age-old wisdom of the people.Straight fit of people's clothing does not require the certainty of the amount. Such clothing is suitable for many, it hides as well as excessive fullness and excessive thinness. Folk style is a variety of embroidery and decoration, bright pure colors. In his Arsenal - the village skirts with frills and flounces, blouses, embroidered jackets and knit sweaters, sheepskin coats and boots, colorful scarves and long scarves. Modern fashion becomes more diverse and freer. Sometimes it allows to combine in one set of products, different in style. A classic suit can be supplemented by a blouse with ruffles, flounces, jabot or blouse in a folk style with embroidery. These blouses can be combined with skirts in a sporty style or pants, etc. there has Been some mixture of styles. But picking up a kit with this decision, you should always have a sense of proportion. Find your style - no easy matter. Look to yourself. Be more critical. Where you are, how do you spend your leisure time? Do not rush, better a little to keep up with fashion than to rush ahead without knowing its laws and regulations. Try to keep your imagination has not led to the blatancy in clothes and unnecessary extravagance. Try to find that great "little", which will make your outfit fashionable and appropriate look. Remember that fashion comes and goes, but style remains.